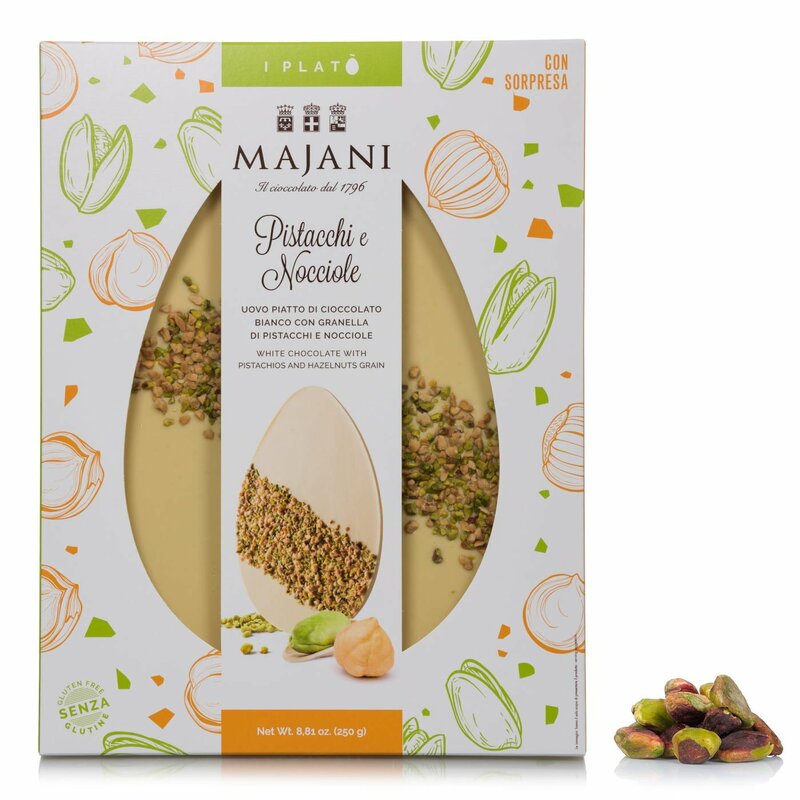 If you're looking for a change from the usual Easter egg, the Majani White Chocolate, Pistachio and Hazelnut Platò will certainly fit the bill. A flat, gluten-free egg, made with the finest white chocolate and chopped hazelnuts. It comes with a special egg-slice, and is perfect to share with loved ones at the end of lunch, or to give as a delightful present. Ingredients Whole milk powder, sugar, cocoa butter, pistachios (4%), hazelnuts (4%), emulsifier: soy lecithin, vanilla. May contain traces of other nuts. For more information on product labels, please contact our Customer Service department. The information on the labels of the products may vary for reasons beyond our control, therefore, there may be discrepancies between the information on the site and that on the products delivered. Please always check the information on the product before consumption or use. Majani since 1796 aims at excellence, without ever losing sight of tradition and quality, values ​​and enthusiasm, all managed with a great passion that aims to give emotions and delight even the most refined palates. His daily commitment is dedicated to achieving the perfect balance between taste, quality and image.